Madhur Jaffrey, television's most-loved Indian cook, returned to our screens for a major new series for the Good Food Channel in October 2012. Travelling across Britain, visiting local Indian and South Asian communities, Madhur revealed how it's possible to sample virtually the whole of Indian cuisine without ever leaving the British Isles. 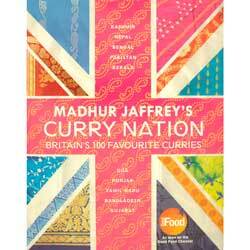 In the official tie-in book to the series, Madhur Jaffrey showcases her favourite curry recipes but keeps to her mantra that Indian food doesn't need to be complicated. Always innovative and contemporary, Madhur will even give some of these traditional Indian recipes a twist - pairing Aloo Gobi with a very British roast lamb, for example. Whether it's the spicy, lentil-based specialities of Rajesthan, kebabs and kormas from Delhi, or coconut-infused curries from Kerala, we accompany Madhur Jaffrey on her very personal tour of our modern-day Curry Nation. "Dear Spices of India, Amazing service - ordered Friday pm, arrived Monday am."